Lady Kitty Spencer is certainly moving into the spotlight, and she’s no stranger at fashion parties. She stepped out in Rome for a Dolce & Gabbana event (not surprising, since she was the face of the brand’s Spring 2018 campaign), and she was dressed head to toe in the label. Almost instantly, her outfit conjured pictures of similar pantsuits that her aunt, Princess Diana, wore in the ’90s. The stunning 28-year-old model wore a white double-breasted blazer with metallic leopard piping that coordinated with her tailored trousers, and she accessorized with a D&G Large Sicily Tote ($1,695-$1,995) and delicate diamond earrings. As it turns out, Princess Diana constructed a near-identical ensemble for lunch with her stepmother, Raine Spencer, at the Connaught Hotel in 1997. Even the shape of Diana’s handbag was comparable to Kitty’s, along with her decision to opt for a classic earring. 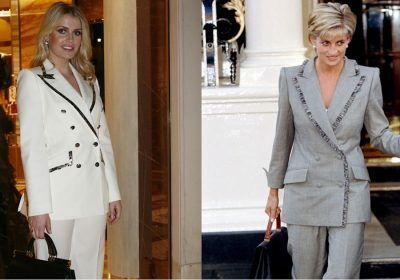 While Diana’s suit was gray, it featured a noticeable ruffled trim, acting as the most obvious connection between these two looks. Scroll for a few more angles, then jump on the royal train and shop for some similar blazers with unique details.